Games love to pummel you with lists of things to collect, places to get to, and enemies to beat. Sometimes you just need to take a moment to pause, catch your breath, and look up at the beauty above. What follows is a list of some of the year’s most memorable games and the skies that hung over them. It’s by no means exhaustive though, so please share some of your own personal favorites in the comments below. As the name would suggest you spend a lot of time in Gravity Rush 2's atmosphere, but the warm yellow and green hues of the game’s “A House in the Blue Sky” sidequest are hard to forget. We could have made an entire list of just Horizon: Zero Dawn shots. Say what you will about everything else, the game is beautiful, and few studios know how to do lighting like Guerrilla. Havarl is one of the game’s most breathtaking planets. If it doesn’t make you want to travel the stars nothing will. Pick any mountain in the game, sit long enough, and you’ll see a stunning sunset. Even if there was nothing else to do or see in Edith Finch, staring out into Giant Sparrow’s brooding sea beneath the clouds and stars would be enough. How it feels when a dragon unit swoops through a sky shimmering with the colors of the battle waging below should be the measure of any strategy game. When they put No Man’s Sky in a Sonic game it was like coming home. The Northern Lights will get you every time, even when you’re hungry and freezing to death. 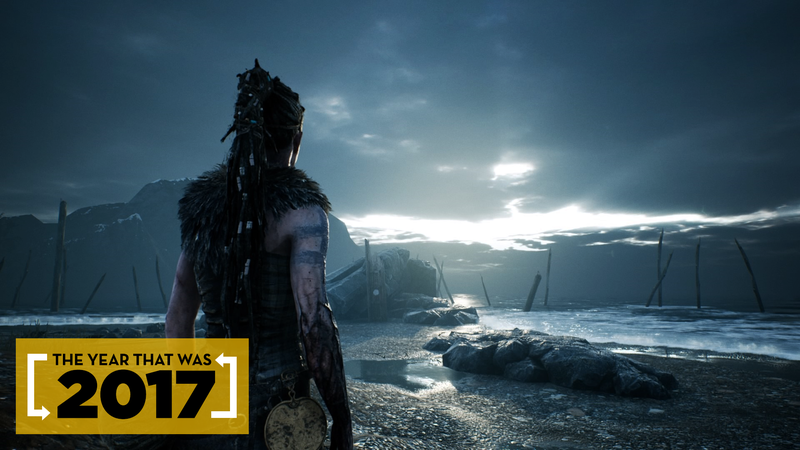 For a game filled with tragedy and sadness, there’s an incredible amount of thrilling life that always feels just over the horizon in Senua’s Sacrifice. It’s a survival sim about collecting resources and taming wild animals, but don’t let that fool you into thinking Ark doesn’t have an awe-filled world worth exploring for its own sake. I’ve spent almost as much time looking up at the sky in Destiny as shooting aliens and comparing guns, and I’ll never stop looking. The city of Karnaca is filled with rats, corruption, and the stench of death. It’s also filled with colors that pop as vividly as any blood splatter. If you’ve been playing racing games for the cars you’ve been doing it wrong. When the sand storms finally settle down it’s entirely worth it. Only Nintendo could stick the moon, a rainbow, and a sherbet sky all in one shot and get away with it. The grim sky that hangs over a forest of gnarled steel beams in Wolfenstein’s New York City still haunts me. I don’t know if it’s a good thing or a bad thing that I’d rather look at Battlefront II’s gorgeous clouds than the Tie-Fighters and X-Wings flying through it, but it’s the truth. Sometimes you just got to go for it. For all its repetitive fluff and impenetrable systems, bright yellow sunsets that look like they could melt your skin off are never a bad thing. Most people aren’t playing PUBG in 4K at a high frame rate, but if you do its deep blues will keep you too distracted to last long.